The Slowly Boiled Frog: Sprigg: "Opposing homosexual ‘marriage’ could cost you your job"
Sprigg: "Opposing homosexual ‘marriage’ could cost you your job"
Unfortunately, Ms. McCaskill’s situation is not unique. Similar career retribution merely for respectfully opposing homosexual “marriage” has been suffered by a salesman in Massachusetts, a theater director in California, a social worker in Maine, a sportscaster in Canada and others. There undoubtedly will be more such cases if homosexual “marriage” becomes legal in Maryland on Jan. 1, as the legislature’s bill provides. The best way to protect religious liberty and to protect one-man-one-woman marriage is to vote against Question 6 on Election Day. First of all, McCaskill was on paid leave and she has been asked to return. An honest question was asked about whether or not the Chief Diversity Officer of a university could oppose equal marriage. Religious fundamentalists have a dependable list of four or five people who they claim have been discriminated against. Usually these are people who have been simply criticized for their activities which usually go beyond just being opposed to marriage equality. Indeed nobody can be terminated for their religious beliefs. 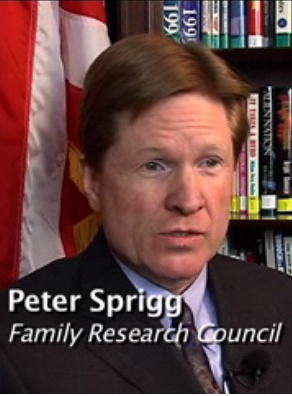 Sprigg and his ilk are protected by state and federal laws. ...without cause and just for being gay!